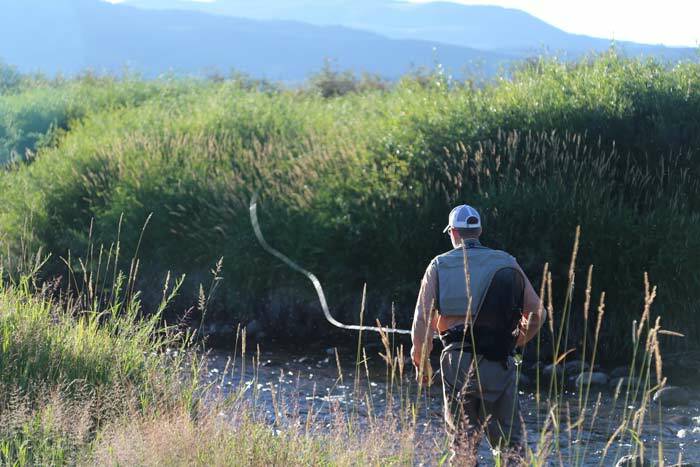 Eagle, Colo. – When avid fly fisherman and part-time Eagle resident Brent Drever joined Frost Creek in May of 2015 he knew the club’s private water on Brush Creek was a good fishery, but he didn’t know how good. As one of a multitude of mountain lifestyle and traditional club activities offered at Frost Creek, it was only after he explored the Club’s section of Brush Creek that he realized its charm, beauty and exceptional fishing. The Drevers bought a home in Eagle Ranch in 2004 as a retreat from Colorado’s Front Range, which they call home. When Frost Creek launched in April 2015, they knew that membership to the club would be a perfect extension to the mountain lifestyle they were already accustom to enjoying in Eagle County. “You look at the activities and amenities that Frost Creek offers in addition to world class golf and realize what a well-rounded experience membership provides. This is especially important to us because we have two sons under the age of 11. They’ll grow up here and can experience all of this,” said Brent Drever. During the time before joining Frost Creek, Drever had fished many public sections of Brush Creek that meander through the Town of Eagle and had been invited by friends a few times to fish Frost Creek’s (then Adam’s Mountain Country Club) private water. In one recent outing, Drever fished for roughly 30 minutes and landed an 18 inch, a 17 inch and four 16 inch trout in that order. “That day I was catching fish on streamers and chose that fly because the fish were obviously very active beneath the surface. I’ve had similar success on dry flies and nymphs and, though I missed it this year, I’ve seen stonefly husks on the rocks in the river and know there is a substantial stonefly hatch up here. The fish are active and healthy”, he said. Much of the creek has a shady canopy of cottonwoods covering it keeping the fish and anglers cool and providing glimpses of additional wildlife such as Blue Herons, Deer, Songbirds and various aquatic insects that provide the fish with nutrition. RELATED: Mountains of mountain activities have made Frost Creek Colorado’s fastest-growing club.